Community Spotlight is a regular feature which highlights amazing fan projects in the Remedy community. For 2018 we're switching things up a little with each month having its own spotlighted fan and fan project. For our August feature I'm excited to talk to Fraser, a dedicated artist and Remedy fan living in Lithuania. There's something about Fraser's work that is uniquely his; with each sketch there's a different emotion behind it and something new being expressed. 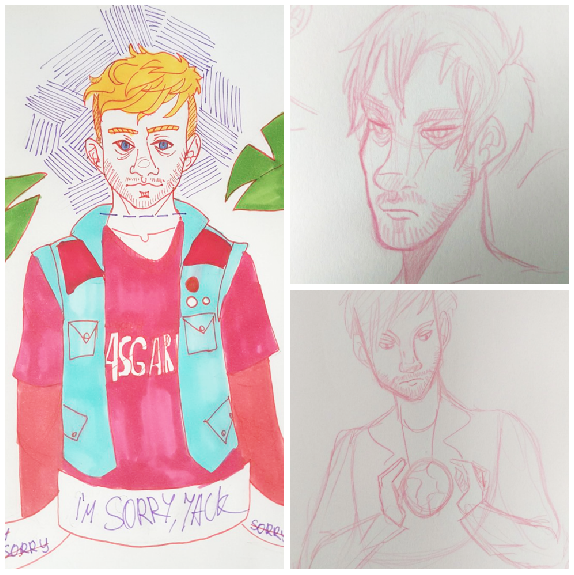 The artwork style can vary with some posts being a full colour piece, and others being a line art sketch, with a style unique to that piece. His work is not predictable but it's something that makes his work especially interesting, and makes each drawing completely its own. While also inspired by Alan Wake and Control, when it comes to his artwork Fraser is more at home publishing his Quantum Break-inspired pieces and with sketching Will, especially in the burdened-state the character was in while creating the Countermeasure. Fraser's artwork is distinctive with sharp lines and a focus on the character's features, whether it be a slight frown at the corner of their mouth or tired eyes from a long day of saving the world. It's the little nods to the characters that makes his work shine. Traditional artwork featuring Will Joyce. The artwork is usually created in a traditional style with line-art sketches carefully created by hand with pencil, but on occasion he will post a full-colour piece and those are especially gorgeous. The colours are bright, strong, and complementary, really making the artwork pop. As they're bold colours, they're used minimally and carefully to not overwhelm the piece, and it's something that Fraser does particularly well in all his full-colour pieces, whether created by hand or digitally. You can check out more of Fraser's work on his Instagram page, HERE. Hi, I’m Fraser. I am a 21 years old from Lithuania, currently studying at University. Also, I really like Alan Wake a ton. My other hobbies are writing and video editing. I’m lacking confidence in my work, but I hope to one day be as good as the rest of the featured artist on this site! Growing up my older brother wanted to be an architect. Obviously, he drew a lot. I thought how cool that was, but it wasn’t until I saw legitimate fanart on a topic I was at the time passionate about that my mind clicked and I went “Wow! I could, too, draw characters I like!” and while of course my skill thankfully improved over the years, I think it’s that magic that really keeps me going. I never feel as much interest in drawing my own characters as much as I adore creating fanart. It’s kind of like taking somebody else’s work that makes you happy and writing a love letter to the creator… just taking out the mushy part. How and when were you introduced to Remedy’s games? Somewhere 2010-2011, one of my older brothers was playing Alan Wake and I saw just some of it and shamefully wasn’t too interested at the time. It’s when the American Nightmare’s trailer came out 2012 that I got a little curious, but even then it took me till 2013 for when I asked for the novelization for my birthday, then ended up spending nights till the book arrived watching gameplay videos. Later, I played the game and then read the novelization. Totally fell in love with every detail in the game. Alan Wake is just a very important piece of art to me, truthfully. What aspect of Quantum Break interested you that made you want to be a part of the community and to create artwork? 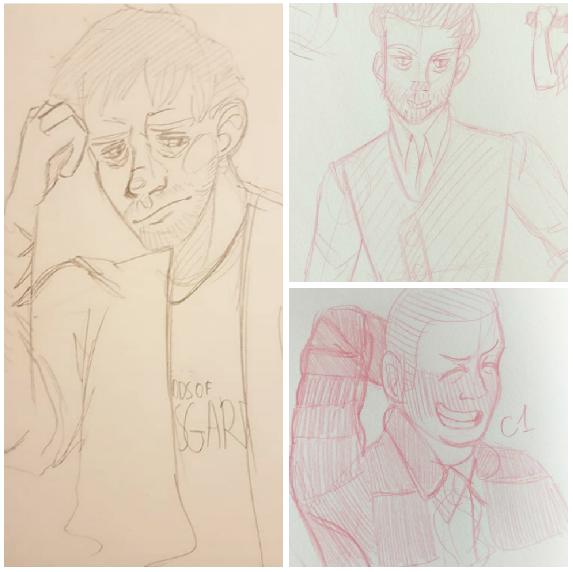 Funnily enough, I was around pre-Quantum Break, but as much as I drew Alan Wake artwork it got scrapped or deleted or laid in my sketchbook for forever to be forgotten. In Alan Wake, it was the characters, the scenery and overall aesthetic, the feeling the story gave me and the story’s beauty that really dragged me in. As for Quantum Break? I was also equally impressed with the characters, aesthetic and story to create work for it. But it was mostly the existence of William Joyce that got me to keep an interest. I thought he was such a great character! I most likely popped up and became more visible in the community because I started using some amount of tagging occasionally and because I already knew a ton of great people from before who made me feel encouraged to create more work. Along with making me feel all right about sharing some of it. From left and clockwise: Will Joyce, Mr Scratch, Barry Wheeler. You’ve drawn a lot of different Remedy characters over the years such as Alan, Scratch, and others, but you keep coming back to Will Joyce. What is it about that specific character that appeals to you? Well, Alan and Scratch are my Remedy favorites; they occupy my mind most of the time. But they also give me an anxiety that I won’t do them justice, so most of the doodles of them get buried away (and that’s a good thing). William, on the other hand, reminds me of myself in an odd way. I might not relate to the genius scientist who can create a time machine, but I sure as hell can relate to the mental illness. I’m pretty open about it, mostly because I believe that shutting people down and making them embarrassed and ashamed of an aspect of themselves they have to live with every day is just plain wrong and awful. As for me and William, well… it just hits close to home. What would you like to see in a potential Quantum Break sequel? Oh, that’s a hard question. I’d like to see much, much more of William Joyce. For one, and most importantly, the Joyce bros reconciling their relationship and William trying to figure out how he could help Jack, given his current predicament. Jack mourning the loss of his friend and the dramatic attempt to save Beth. Just more angst and emotional moments, please! Thank you for the interview, Fraser! You can see more of Fraser's work on his Instagram page, Seraphimcorpse.